Rep. Rob Kauffman (R-Franklin) today paid tribute in the House chamber to his predecessor Rep. Jeff Coy who passed away on June 4. Pictured (from left) are Speaker of the House Mike Turzai; Kauffman; Coy’s wife, Jo Anne Coy; family friend Denise Yarwood; and former House employees and co-workers of Coy, Paul Resch, current director of gaming operations for the Gaming Control Board; Doug Harbach, current director of communication. HARRISBURG – Rep. Rob Kauffman (R-Franklin) today paid tribute to his predecessor, Rep. Jeff Coy who passed away on June 4 of this year. Coy represented the 89th Legislative District in Franklin and Cumberland counties from 1982 to 2004. During his tenure, he served as both Democratic Caucus chairman and secretary. 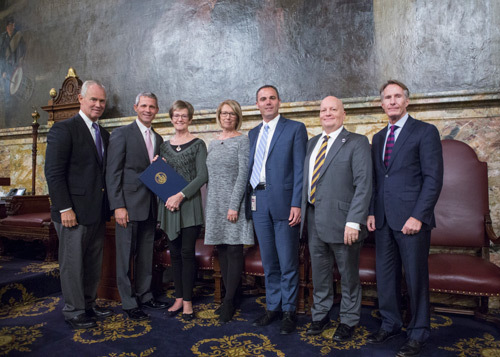 In addition to Kauffman, remarks were also given by Rep. Mark Keller (R-Perry/Cumberland) and Harry Readshaw (D-Allegheny) of the House Masonic Caucus, of which Coy had been a member; and House Democratic Leader Rep. Frank Dermody (D-Allegheny/Westmorland), a former colleague of Coy’s. To view footage of the tribute to Coy given in the House chamber, go here. Coy’s wife, Jo Anne, was present for the tribute to her husband, as well as friends and former colleagues of Coy.